My research covers different aspects of marine geology and geophysics. I have for several years been involved in geophysical investigations of natural gas hydrates in arctic areas, focusing on identification, quantification and characterization of hydrates and associated free gas accumulations. 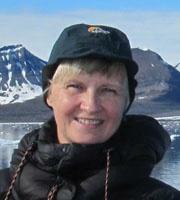 My current research projects relates mainly to Cenozoic development of the Barents Sea area. I have used a wide range of methods in my research and have expertise in geophysical processing, modelling, interpretation of mainly P-wave but also S-wave seismic data. The last few years I have focused my research efforts on glacial geomorphology, sediments and processes. This includes research on identifying ice streams of the former Barents Sea - northern Fennoscandian Ice Sheets and reconstructing their behaviour through the Pleistocene. The use of three-dimensional (3D) seismic has been important in this work, and I have, together with a colleague, been responsible for establishing a geophysical laboratory in interpretation and visualization of 3D seismic data at UiT.